Ahead of tomorrow’s first trailer, Paramount Pictures has debuted Baywatch trailer teases that you can watch in the players below! Baywatch reteams Dwayne Johnson with his San Andreas co-star Alexandra Daddario alongside Zac Efron (Mike and Dave Need Wedding Dates), Kelly Rohrbach (Broad City), Jon Bass (Loving), Ilfenesh Hadera (Oldboy), Priyanka Chopra (Quantico) and Hannibal Buress (Broad City). Baywatch offers a big-screen take on the television series that originally premiered on NBC in 1989. The original Baywatch cast included David Hasselhoff, Parker Stevenson, Shawn Weatherly, Billy Warlock, Erika Eleniak, Peter Phelps, Brandon Call and Holly Gagnier. The series was initially not a success and was cancelled after a single season. Plans were made, however, to move Baywatch into first-run syndication and, in 1991, Baywatch returned to the airwaves where it continued for a full decade, bringing in new cast members like Yasmine Bleeth and Pamela Anderson. The show also received a short-lived spinoff, Baywatch Hawaii. Although several writers have been attached to the Baywatch movie, the most recent draft hails from the Friday the 13th pair of Damian Shannon and Mark Swift. Horrible Bosses and Identity Thief director Seth Gordon is helming the new Baywatch film, which is being produced by Dwayne Johnson alongside Michael Berk, Greg Bonann, Beau Flynn, Dany Garcia, Ivan Reitman and Douglas Schwartz. Baywatch hits theaters on May 26, 2017. 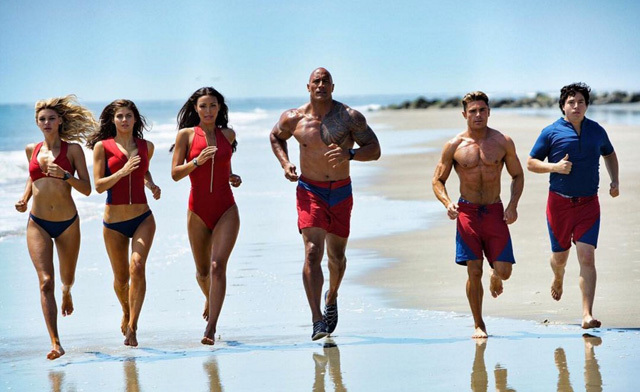 What do you think of the first Baywatch trailer teases? Are you planning to check this one out on the big screen? Let us know in the comments below!